“I first heard about Confluence through my friend Hal, who’s Pip and Guy’s son. They were putting on a series of arts programmes and events and I did the Riverside empty shop windows project with them, a few years ago. Me and my girlfriend at the time did an installation where we made a living room scene and painted the whole shop floor, walls, armchair and so on with triangles, in the same pattern. And there was a giant 14 foot long lizard in there, camouflaged in with the same scene, which Toby from Small World Theatre helped me to make from pipes and willow and stuff. I’ve also helped them out with other events, including things at The Lab and a day invigilating at the Platform film screening up at the old records office. That was fun and it was interesting to see the inside of that building. I also did Breaking Out of the Gallery last year after getting inspiration from living in Denmark for three months. I was staying with Pip’s brother, Dave, who was working for a theatre where they put on art shows for opening parties and things like that. So I was working with him, building sets and stuff like that and it was a very rewarding experience. When I came back I wanted to keep the ball rolling and so I decided to get lots of different pieces of art work from people all over Pembrokeshire and put them up on walls. There was a lot of help along the way. I met Richard Blacklaw at the Ideas Lab and he had a similar idea so we joined forces. And then I met Jessica. We had 21 different artists involved and 33 paintings and it went really well. Most of the work was displayed along the river, in the Riverside shopping centre and a couple on the front of the multi-story car park and in little alleyways adjoining Bridge Street. The work is commissioned and painted onto specially prepared board so it can withstand the elements. We had a private view tour of the all the paintings when they first went up, as part of Haverfordwest Festival Week, and we had a really good turnout for that, over 100 people. The Transition group got involved as well and supplied all of the food for the opening and we got to use their public liability insurance, so it was a Transition project as well. Lots of different organisations came in actually and helped to make it happen, because it’s a lot of work. We’re going to do another Breaking Out of the Gallery this year, we haven’t decided on dates yet, but we will have something during festival week, hopefully an artists’ talks’ event. We’ve also had interest from people in Fishguard and Milford who might want to do a similar thing there. We raised some money out of last year’s project to put towards this one by having a closing party and auction at the end of the show. We took all of the work down and displayed it in 8 Spring Gardens and took 40% of the painting sales to reimburse ourselves, as we had gone over the original £500 Ideas Lab budget. We have about £1000 to put towards this year’s project and we’re going to aim a lot bigger, so the trail will come all the way up to the top of town, Hill Street, Market Street, Tower Hill, Barn Street, High Street and also Bridge Street, to bring it more into the public eye. We’d also like to have more that are visible from the roadside, so that people who are driving through can see them and get a better impression of Haverfordwest. I think that Confluence has opened up the doors to lots of other projects. I would have struggled to set up the Breaking Out of the Gallery project without their help. And I know that through the Ideas Lab lots of other small projects have started off and they’re planting the seeds for bigger things to come. It’s like my project started off quite small and hopefully it’s going to grow, year on year. 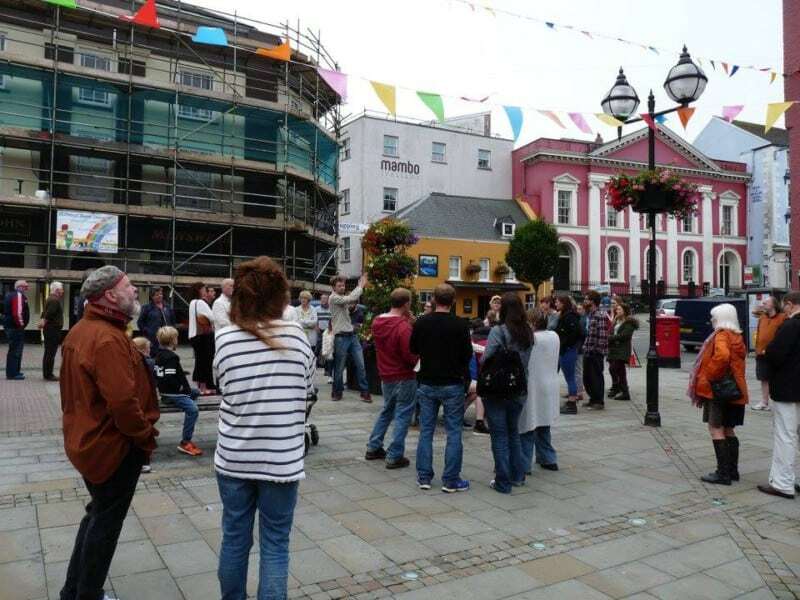 Our main objective with the project is to spruce up the town, which is the same as the Confluence objective, trying to change people’s perceptions of Haverfordwest and jazz the place up a little bit, get more people involved and create more vibrancy, which is what it really needs. I think Confluence is doing well at making that happen, getting the ball rolling, although we still have a long way to go. One project I really like that was seeded by Confluence is EPOC, Empty Properties Owners Club, which came out of the Ideas Lab. They’re looking at different uses for empty buildings and I found their talk really exciting, they’re looking at all sorts of different uses, community spaces and stuff. I hope it carries on because Haverfordwest is full of empty properties, which is probably one of our strongest commodities. Also, Confluence has helped more creative things happen in the town like a few commissions that have brought in big artists to do community projects. There’s been something on at The Lab at least once a month, which has been really good. And it’s helped people work together, like Spacetocreate and the Business Circle and people who do the yarn bombing. So I think The Lab has been the most beneficial thing, bringing together all these different groups to collaborate together on projects. All of this is really important to me because I’m passionate about where I live and I to see more arts activity happening in the town and do what I can to make it better, rather than moving away somewhere else. Although, I think Confluence has made a good solid start at changing people’s perceptions, I think it’s going to take a lot more money to get the town to where we want it to be. We’re battling against these out of town shopping centres and other new developments and big businesses that are dragging the town down. Confluence is just a small fish fighting for a place in a big pond, which obviously makes it a very challenging thing. But they’ve definitely made a good start and helped to bring other projects together, and I have seen some really positive changes in the last few years in terms of creative activities and people’s perceptions, but we’ve still got a lot of work to do. There are other changes that might have started happening anyway, if you look at things like the VC Gallery and the Spark shop, there are lots of people who have an interest in making creative things happen. I think Confluence has been a catalyst to that and has definitely helped to speed up that process and motivate people.